Besides the widely known fruits such as “faith in Jesus, tithing, etc…” The Bible gives us 8 major teachings that we can use to identify the true remnant church ~or~ Bride of Christ in the last days. If we were to look for this church we must not settle for just any church, we must make sure it is exactly as the Word of God describes it to be. It must be God’s church! I won’t settle for anything less for my self or my family. Why should you? As is usually the case, most people go to the phone book to find a church they can attend. They usually pick the one closest to them for convenience. However, this could be very dangerous. This is where you will be “taught” what you NEED to be taught to help you understand and grown in Jesus. You cannot take something that affects your eternal life too lightly. You must be VERY serious about choosing a church. You must go to the Bible to find the church you should attend. Let me ask you this… If you had a flannel shirt that you liked very much, and the pocket was torn from it completely, would you replace the pocket with a look alike fabric that doesn’t quite match up? Or…Would you go to the factory where the shirt was made and find the true remnant of your shirt to make an exact match? This is exactly what we should be doing. We should be going “back to the factory” in search of the church that the Lord Jesus started. 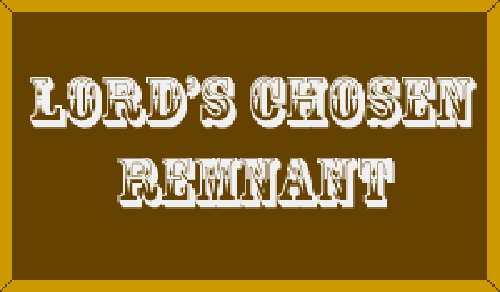 1.The remnant church MUST be a Bible believing church. The Bride of Christ must believe the Word of God to be totally and without a doubt… “INFALLIBLE.” The remnant church will not teach man’s traditions as being “equal authority” with Scripture. It will teach exactly as Jesus taught it to teach. They must rely entirely on the Bible. They must be entirely “anchored” and not “swaying to and fro” (Ephesians 4:14) in any way concerning the Word of God. The church uplifts Jesus as Saviour, not traditional ceremonies of mankind. It will be a church for all of God’s children as well. It will not be a church JUST for Jews, African Americans, Irish, Greeks, Polish, etc… Was Jesus “JUST” for Jews, African Americans, Irish, Greeks, Polish, etc…? John 3:16 For God so loved the world, that he gave his only begotten Son, that whosoever believeth in him should not perish, but have everlasting life. 3. The remnant is a church that awaits & believes in His second coming as FACT! John 14:1-3 Let not your heart be troubled: ye believe in God, believe also in me. 2 In my Father’s house are many mansions: if it were not so, I would have told you. I go to prepare a place for you. 3 And if I go and prepare a place for you, I will come again, and receive you unto myself; that where I am, there ye may be also. Jesus warned the early church of disaster, and when it happened in 70AD the christians already knew about it and fled to safety, yet 1,100,000 Jews died because they couldn’t believe it. (See People Get Ready) Well all the worldly churches don’t teach much about the return of Jesus at all, so… When Satan makes his appearance as the “christ,” the world won’t know that Jesus warned them of this farce in advance, so… They will be tricked into oblivion as were the 1,100,000 Jews in 70AD. Praise God for divine wisdom people, praise God! 4. The remnant will be a church that teaches the Biblical truth about death. The Bible mentions the word soul over 800 times but never once does it mention an immortal soul! If the church you find teaches a natural immortality for the soul, it cannot possibly be the remnant church. (For much more info on this fact… See “Immortal soul?“) Matthew 10:28 And fear not them which kill the body, but are not able to kill the soul: but rather fear him which is able to destroy both soul and body in hell. If the soul is naturally immortal for all eternity, how is it possible God says the soul can be destroyed in hell? 5. The remnant will be a health conscious church. 1 Corinthians 6:19 What? know ye not that your body is the temple of the Holy Ghost which is in you, which ye have of God, and ye are not your own? 1 Corinthians 3:17 If any man defile the temple of God, him shall God destroy; for the temple of God is holy, which temple ye are. 6. The remnant will be a commandment keeping church. This one is utterly the easy one to spot for anyone. Most churches today keep 9 of the 10 commandments. Some only keep 8..7…or merely 5 of the commandments. Yet the New Testament confirms that ALL ten of the commandments are still valid. (See “The Law“) So the remnant will be easily recognized as one who keeps the fourth commandment as well. They will be Sabbath keepers. (See “Sabbath“) I John 2:4 He that saith, I know him, and keepeth not his commandments, is a liar, and the truth is not in him. 1John 3:22 And whatsoever we ask, we receive of him, because we keep his commandments, and do those things that are pleasing in his sight. 1 John 5:2 By this we know that we love the children of God, when we love God, and keep his commandments. 1 John 5:3 For this is the love of God, that we keep his commandments: and his commandments are not grievous. Revelation 12:17 And the dragon was wroth with the woman, and went to make war with the remnant of her seed, which keep the commandments of God, and have the testimony of Jesus Christ. This is the end times and there are many good people in the un-biblical churches that are being called out as we speak simply because Revelation 18:1-4 says they are being called out. And Scripture is INFALLIBLE. It is man’s FAITH that is fallible. They are being called out to be a part of the remnant church, and according to the Bible, that means a commandment keeping church! 7. The remnant will be a church that teaches Biblical “full immersion” baptism for repented adults only. Also see “His Written Example” for a more in depth look into your walk.